Ian reports on a bonus day at Grosmont today, on a cold drab morning with a snow covering on the moors. But brighter later on. With Trevor Wilford, Nigel Hall and Ian. As Trevor couldn't make it any other day this week, Ian went to Grosmont to assist him with some welding Jobs. The stove was lit when we arrived as Martin Ashburner had got in early. So a brew was made and a warm up round the stove. Trevor had manufactured 3 plates to cover the J27 safety link pins and tender draw bar pin. The draw bar pin cover needed a piece of 3 1/2" diameter tube welding to the underside of the plate. Ian found a piece near the scrap bin which Trevor cut to size and welded it to the plate: it was a perfect fit. The other 2 plates had to be tack welded in position because there was not enough depth for a tube fitting under the plate. Then to the Q6, where the right trailing spring over bracket was found to be coming away from the tender frame. 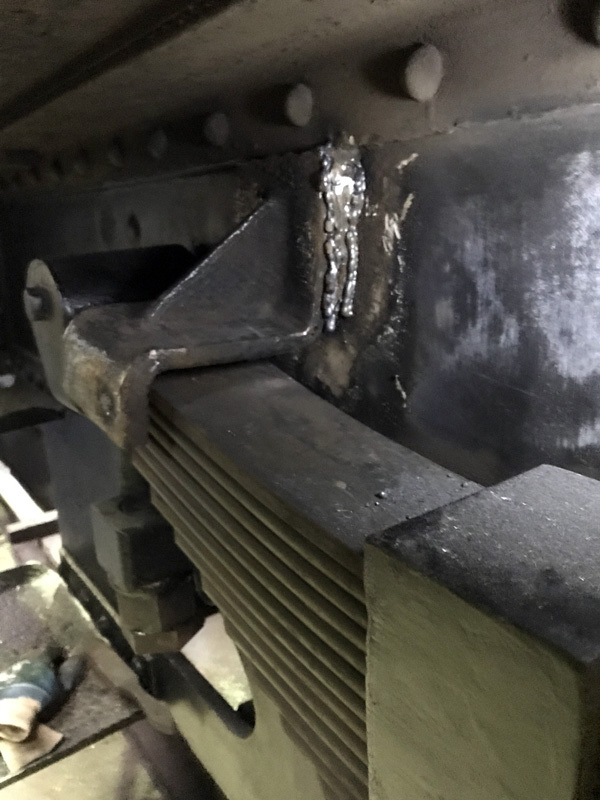 The old weld was ground out and then re-welded (see photo). It had been intended to weld some chain on the inside door of the J27 locker to stop it crashing down on to the water valve handle. Having found some chain and cut it to length we could not weld it as the welder would not reach. The whole welding machine needed lifting about a foot off the ground and, as Trevor wanted to be away home by 3pm and we needed a few bodies to lift the welder high enough to do the job, Trevor will do it next time. Ian also completed NDT crack test for the Q6 and J27 safety valve bodies and sent photos to Barney. Nigel completed glossing the left hand side of the frames and also the hand rails. Lunch was had around the stove, and there is more room now the white cabinet and box has been moved out.